ALL OF OUR ANIMALS HAVE OVERCOME SITUATIONS IN LIFE THAT NO ONE SHOULD HAVE TO ENDURE. THEY HAVE BEEN NEGLECTED, ABUSED, OR ABANDONED. EVEN WITH THE TREATMENT THEY HAVE RECEIVED IN THE PAST, THEY AMAZE US WITH THEIR TRUST AND LOVE FOR THEIR HUMANS. IF YOU ARE CONSIDERING SAVING A LIFE THROUGH ADOPTION, PLEASE SEE OUR PICTURES BELOW OR CHECK US OUT ON OUR ADOPTION SITES. CLICK FOR YOUR ADOPTION APPLICATION! ALL OF OUR FRIENDS ARE UP TO DATE ON VACCINATIONS AND PREVENTATIVES, MICROCHIPPED, HEARTWORM TESTED (IF OLD ENOUGH), AND SPAYED OR NEUTERED. OPERATION EDUCATION MAY REQUIRE A PHYSICAL FENCE FOR OFF LEASH PLAYTIME, DEPENDING ON THE DOG. ALL ANIMALS IN THE HOME MUST BE UP TO DATE ON VACCINES, ON A HEARTWORM PREVENTIVE AND BE SPAYED OR NEUTERED. 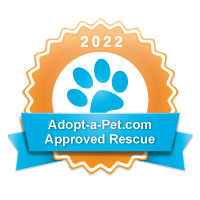 WE WILL CONDUCT A HOME VISIT AND A VET CHECK TO ENSURE ALL THESE QUALIFICATIONS ARE MET.